As you can see, Florentine is a beautiful rich paper line with greens and golds and twilight blues, and although my projects are more feminine, this paper could certainly apply for masculine themes as well. I've used the new Dark Chocolate Tapestry Velvet Rub-ons on each project, since they are the perfect compliment to this paper pack. 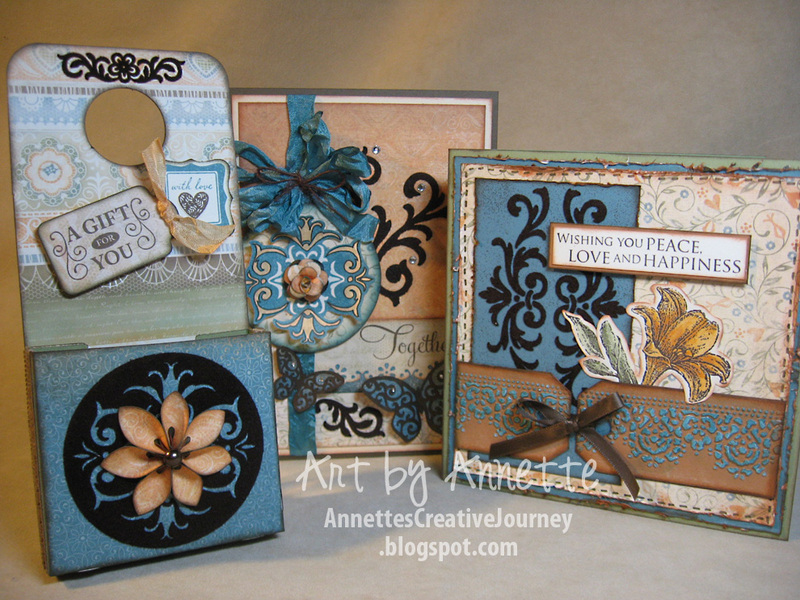 The tall card in the back of this photo was my design for the March Stamp of the Month "Potential." You can find all the details about this card here. The project on the left is a door hanger from the Art Philosophy Cricut Cartridge. I cut it at 11 1/2 inches on the Cricut which makes it stand 7 1/4 inches tall when assembled. The flower you see above is inspired by fellow consultant Connie MacFarlane. 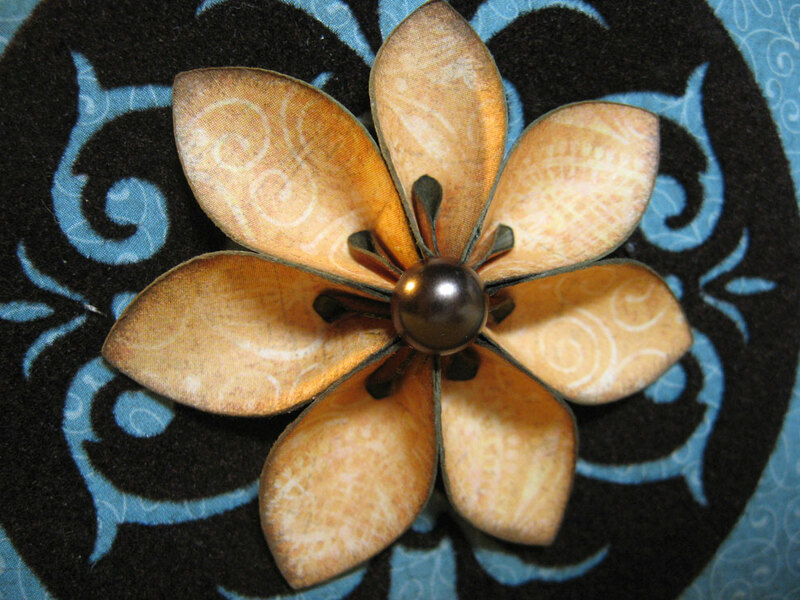 She provides a video tutorial here on how to make these simple and dimensional flower petals. See the large decorative circle behind the flower? That's another Tapestry Velvet Rub-on. Love these! Another trick I learned from Connie is how to properly colorize our new Color-Ready Seam Binding ribbon. Just 8 parts Isopropyl Alcohol to 1 part re-inker in a spritzer. 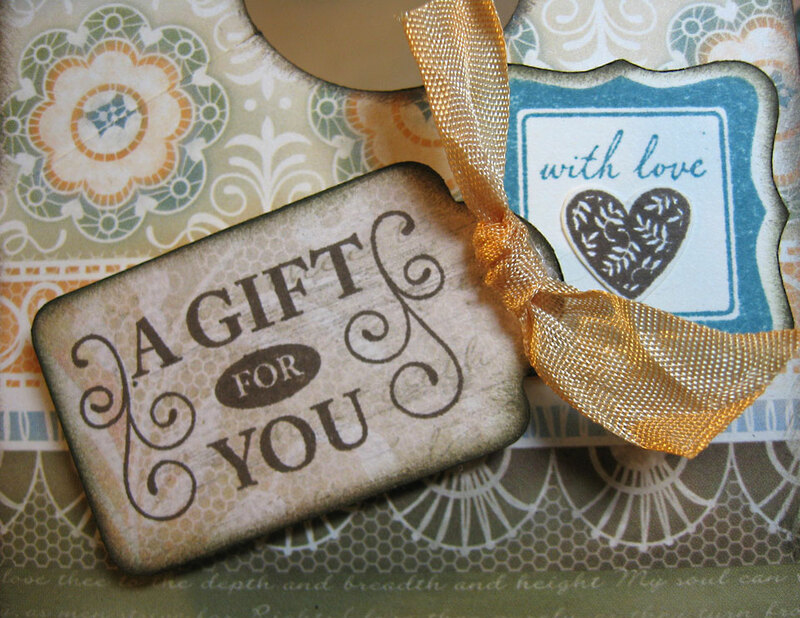 I like to crinkle up the ribbon so it has more of an aged look to it. I colored this knotted ribbon with Creme Brûlée re-inker. I did the same with the first card mentioned, only using Twilight re-inker. I love how easy this is to do and the wonderful results that you get. 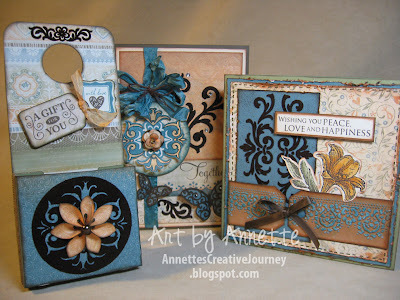 The stamp set I used here for the small tags is called "Enjoy." 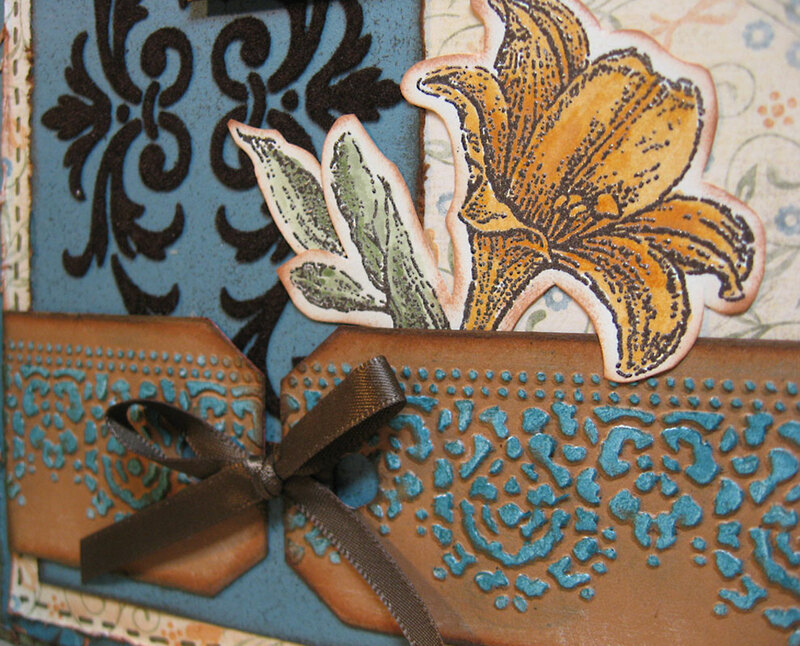 With the help of Tim Holtz's embossing Textured Fade from the Valentine Background and Borders set, I created this detail on the tags that meet together on the second card in the photo above. After embossing the card stock tags, I sanded the raised edges to expose the white core, then lightly brushed over those raised edges with Twilight ink on a sponge dauber. 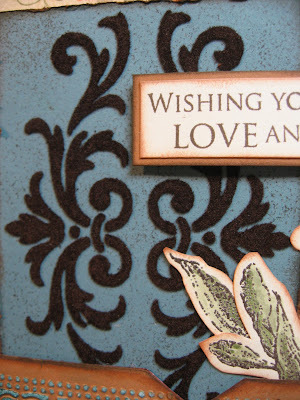 The velvet rub-ons are so easy to use and add such a nice touch of texture to cards and layouts. Here's another close-up. I added some speckling to the card stock background by using a texture tool and some Cocoa ink. Be sure to check back later today to get the links to all the great products used in these projects. And then check back again this weekend when I post my enhanced version of the Florentine Workshop on the Go. These cards are just beautiful.